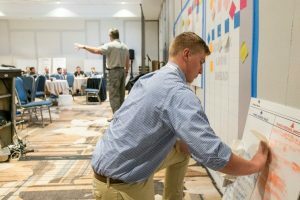 The LCI Immersive Education Program offers in-person education courses led by LCI Instructors to equip design and construction practitioners with the knowledge and skills to implement Lean practices with teams. Click on each course below to see descriptions, learning objectives, simulations, continuous education units and more. The latest results are in and provide empirical evidence that Lean Construction correlates to better project outcomes! This session will present the highlights of two LCI-sponsored research studies by Dodge Data & Analytics and University of Minnesota. We collectively examined 172 projects across the country to learn from the good to the great and why some projects excel. The research advances LCI’s primary goal of increasing owner and supply chain satisfaction with design and construction delivery. The subject matter of this course is What is Gemba and more particularly, How to do a Gemba Walk effectively? It will be presented using custom videos and content will be reinforced by interactive group exercises, questions and discussions. Participants will leave with tangible takeaways they can use to make improvements to future Gemba Walks. Unpredictable workflows correlate with an increase to construction costs and schedules. In response to 1990s research revealing 54 percent of construction project commitments were completed on time, LCI developed the Last Planner® System (LPS) with five connected conversations or levels designed to help project teams maintain reliable workflow while maximizing efficiency and safety. Now, you can complete LCI's Introduction to Last Planner® System to learn how it improves communication, trust and transparency across all stakeholders. Engage in group discussions and see for yourself how variations in flow impact the entire project with the Parade of Trades simulation embedded in this 4-hour LCI education course. What if you could add more value for your customers while meeting schedule and budget requirements? By recognizing the various types of waste in project delivery processes, you can start to increase productivity by implementing the Lean approaches taught in Introduction to Lean Project Delivery. With a small mindset shift, the silos set up by traditional delivery methods can be broken to allow architects, engineers, general contractors, trade partners and owners to closely collaborate and problem solve together. This 5-6 hour LCI education course, taught with real-life design and construction examples and a hands-on simulation, will be an important step on your journey to achieve Lean thinking. What if you could add more value for your customers while meeting schedule and budget requirements? By recognizing the various types of waste in project delivery processes, you can start to increase productivity by implementing the Lean approaches taught in Introduction to Lean Project Delivery Webinar. With a small mindset shift, the silos set up by traditional delivery methods can be broken to allow architects, engineers, general contractors, trade partners and owners to closely collaborate and problem solve together. This webinar will be an important step on your journey to achieve Lean thinking. During this session, participants will learn why it is important to collaboratively plan during design phases and how Last Planner® System (LPS) is an effective tool to support improved delivery for their projects. This use of LPS is adapted to the specifics of design, which is about advancing the flow of information. LPS has been used by teams during design to stabilize their delivery process by keeping all team members' needs being met reliably. This LCI education course will include a learning simulation to support the concepts. 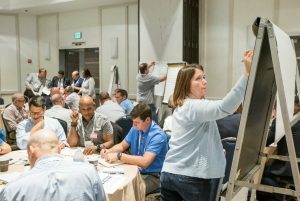 Lean is increasingly being used in Design-Build project delivery and naturally supports and builds on the collaborative environment necessary for success in design-build. Learn how Lean naturally fits into design-build delivery and how you can integrate Lean into your design-build projects. The concepts of Big Room, Last Planner® System and Target Value Design are all integral to building successful teams that in turn deliver successful projects. Target Value Design is a key component in the growing application of Progressive Design-Build to enhance the value proposition for owners. Design professionals want to know how they can improve client outcomes while maximizing design excellence. 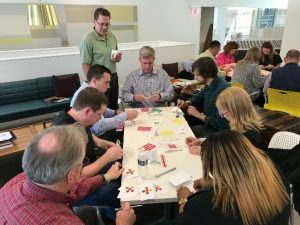 Lean in the Design Phase is a course that leaves participants with a strong knowledge base for understanding how connecting people, principles and practices during the design and planning phase leads to on-time, on-budget delivery. Participants will be exposed to how Lean processes such as Target Value Delivery, set-based design and Last Planner® System can be applied at the front-end of a project to increase team productivity and level the workload. Understand the designer’s role in the design of building systems in the design phase, leading to the efficient technical coordination of the BIM. Learn how Lean tools and processes eliminate waste to generate construction documents with fewer errors and omissions at a higher productivity. Learn how the Lean Operating System enables design solutions supported by analytical data and pulled to the Owner’s value proposition. Learn how Lean enables the effective transfer of construction systems knowledge with approaches such as Big Room and Target Value Delivery. High-performing teams function on collaborative brain power to rapidly advance work and add value by driving down overall project costs in a Big Room setting. Effective Big Rooms are only possible with the right kind of mindset and behaviors that break down the traditional silos to allow for cross-functional team collaboration and decision-making. The Mindset of an Effective Big Room course creates a simulated Big Room experience encouraging you to create, manage and lead your own detailed Big Room concept and implementation plan tailored to your project’s specific needs whether you have had previous experience or not. Small groups will discuss onboarding new members, technology and real-world challenges to Big Room implementation. Then, participants will report back to the large group to share and create a list of standards and better practices. Staying within the allowable budget and ensuring the team’s innovation decreases waste and increases value to the customer are attributes of successful project delivery and can be achieved through Target Value Delivery (TVD). TVD is a disciplined management practice with several phases (Business Case Planning, Validation, Value Delivery and Value Post Construction) meant to be applied holistically to obtain maximum value. The phases of TVD can be supplemented by core components like team organization, Big Room, project planning, cost modeling, continuous estimating and conceptual design. Start your journey toward mastering each of the TVD phases and all of the core components through simulation, group discussion and step-by-step guidance in the 8-hour Target Value Delivery course to align your project deliverables with customer-defined value. Where can you participate in in-person education courses? Go to the eLearning page for more information. Make-A-Card simulation in the Introduction to Lean Project Delivery course. LCI Congress participants learn the 5 conversations in the Introduction to Last Planner® System course. Mindset of an Effective Big Room allowed LCI Congress attendees to immerse themselves into an authentic Big Room atmosphere. 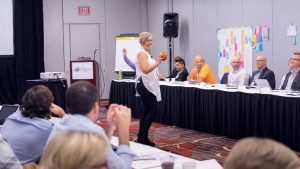 Target Value Delivery teaches participants how to align project deliverables with customer-defined value at LCI Congress.